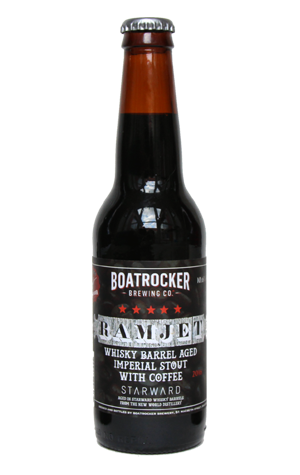 Earlier this year, at the first Ramjet Day at Boatrocker's Barrel Room, one of the treats served up to guests was a coffee version of the brewery's much-loved barrel-aged imperial stout. And now Coffee Ramjet is being made available to a wider audience. As with straight Ramjet, the beer spent time in Starward whisky barrels before the coffee was added; whole beans were infused into the beer directly – the equivalent of an espresso shot per 330ml bottle. That might sound a lot but, if you've been following Boatrocker for the past few years, you'll be well aware that founder Matt Houghton and his brewers tend to deal in subtleties, so while the coffee adds a roasty espresso lift to the aroma rising from its pillowy, crema-coloured head it doesn't dominate. Indeed, throughout the coffee acts as a decorative twirl – alongside the impact of the Starward barrels – atop the dense, chocolatey lusciousness that's helped Ramjet gain the reputation is has in recent years, making it a welcome companion piece for fans of the original rather than a radical departure.